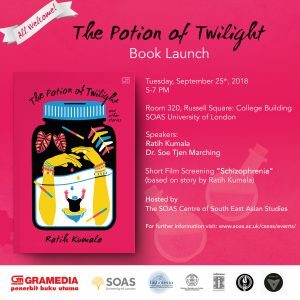 The book launch will discuss Ratih Kumala’s book Larutan Senja, which has been translated as The Potion of Twilight. Published in 2006, Larutan Senja is a collection of fourteen short stories written by Ratih Kumala. Most of her short stories in this collection have non-linear timelines, quick switching of narratives and settings, and transgressive female characters. Ratih Kumala however is not merely following the trend of these female authors without a “stamp” of her own. Her challenge of the previous writings is expressed in her cynicism to life, its value and romantic relationship. This collection of short stories have been translated by Soe Tjen Marching, and published by Gramedia. During the book launch, there will be the screening of the short film “Schizophrenia” written by the author and directed by Ikhwan Ridho. She will also distribute free books to give away.